Eight teams will face off this week at the FIVB Women’s Club World Championship in the Philippines. 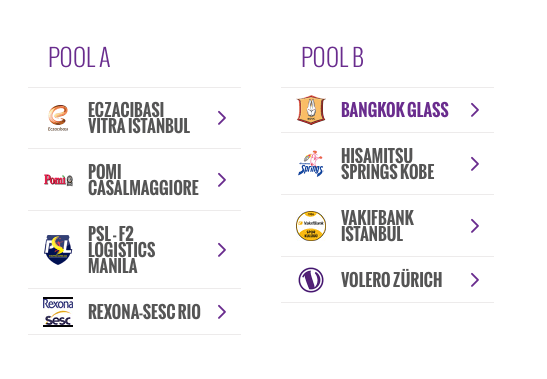 Pool A is: PSL-F2 Logistics Manila, Eczacibasi Vitra Istanbul, Pomi Casalmaggiore, and Rexona-Sesc Rio. Pool B is: Bangkok Glass, Hisamitsu Springs Kobe, Vakifbank Istanbul, and Volero Zurich. Vakifbank Istanbul will Hisamitsu Springs of Japan on Monday night to kick off the tournament. On Tuesday in pool A, Pomi Casalmaggiore of Italy, the 2016 European Champions, will play Eczacibasi Vitra. PSL-F2 Logistics, the hosts, will compete with Rexona-Sesc, the 2016 South American Champions. In pool B, Volero faces Bangkok Glass, the 2015 Asian Champions. The semifinals are on October 22, and the third-place and gold-medal matches are on October 23. In May, FIVB and Eventcourt announced Manila would host the championship. It’s the first volleyball world championship to be held in the country. The tournament is Bangkok Glass’s first championship appearance. The club was founded in 2014 and punched their ticket to the 2016 world championship when they won the AVC Club Championship last year. It’s looking for redemption after losing to the NEC Red Rockets of Japan in the 2016 AVC Club Championship in hard-fought five sets. They’ll face Volero, which holds a 6-6 all-time record at FIVB world championships. It won bronze last year after defeating Rexona-Ades Rio. Eczacibasi Vitra is looking to its top player, hitter Jordan Larson-Burbach, to lead it to a second FIVB World Championship title. Larson-Burbach is a USA national team player who joins Olympic gold medalist Thaisa Menezes of Brazil, FIVB world champion Tatiana Kosheleva of Russia, and Rio 2016 bronze medalist Rachel Adams. Vafikbank last appeared in the FIVB world championship in 2013, when it won gold. It’ll face Hisamitsu Springs, who will host the 2017 FIVB Club World Championship. You can watch the matches throughout the week on FIVB’s YouTube channel or follow FIVB on Twitter @FIVBWomensCWC.